I am a creature of habit and often times slow to eat from a place outside of my regular rotation. I realize this is not the most productive trait of someone who claims to be a food blogger but its something I am working on. This is the only excuse I could muster for why I have lived in Durham for two years and am just getting around to eating at The Original “Q” Shack. While I am ashamed the first step is confessing your short comings then eating them. 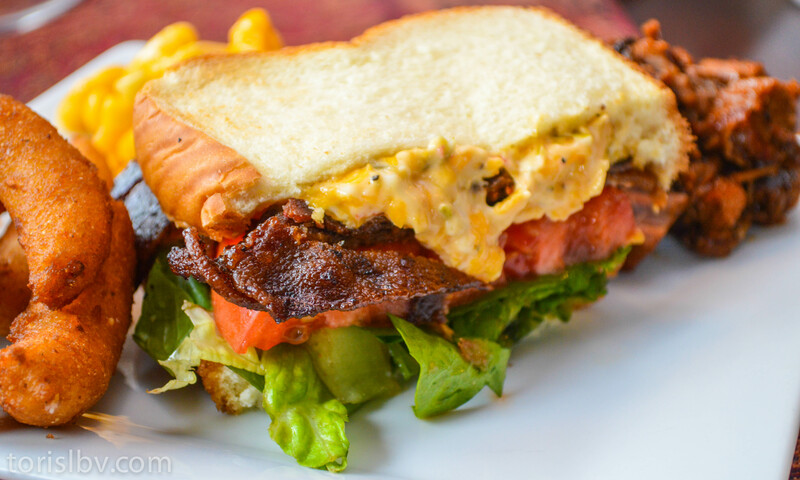 Pimento Cheese BLT – This sandwich brings BLT to the next level and had me thinking BLT stood for BeLongs in my Tummy (I don’s use the word “tummy” much when not talking to my son but I needed something that started with a “T”, dont judge me). Owner Daniel Ferguson is proud of his pimento cheese and states ” the pimento cheese is different than anyone else’s. We use processed pepper jack cheese to make it creamy, lots of jalapeños, cheddar, mayo, roasted red pepper and a ton of black pepper”. The bacon had a nice smoke flavor and crisp crunch. Dan explained that the bacon is ” super smoked in house from the raw stage until crisp in the smoker”. All of this with the obligatory but fresh lettuce and tomato between soft white bread makes for a serious sammy.